The bike with sidecar and the business were created to assist families in their celebration for the life of their departed. To give one of the most unique services that can be provided as they would have wished for one of their own. Our motorbike is designed and manufactured by Harley Davison Inc a Soft-tail Deluxe. The seating on the Harley can be altered to either a lone rider or comfortably accommodates for the partner / family member or friend to ride along side during the final ride including a sissy bar if required. The motor bike has a slightly modified exhaust, note which remains distinctively to Harley-Davison sound. The stunning black and chrome finish is resplendent in it beauty, with white walled tires on the Harley as well as the sidecar. The sidecar chassis is professionally customized built by SRK Engineering of Bathurst in N.S.W. 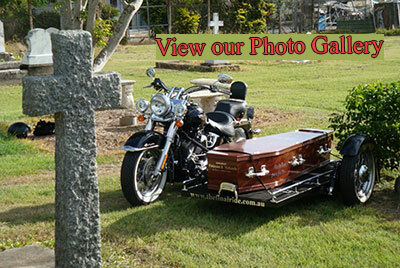 The sidecar platform has been handcrafted by Keith himself, to fit most size coffins. High quality chrome fittings, end clamps secure supplied by Coachcraft, Thomastown Vic. The coffin can be placed or removed from either front or rear and rollers for easy movement without compromising its pristine presentation. The coffin in our photos has been donated to the Rockhampton HOGS by Finlayson and McKenzie Funeral Directors of Rockhampton. We have also included a removable pole at the back of the platform to hold flag colours if required.